This rendering shows the proposed Eagle Climbing Gym, planned at 700 Chambers Ave. The site is located just east of the Eagle Post Office. 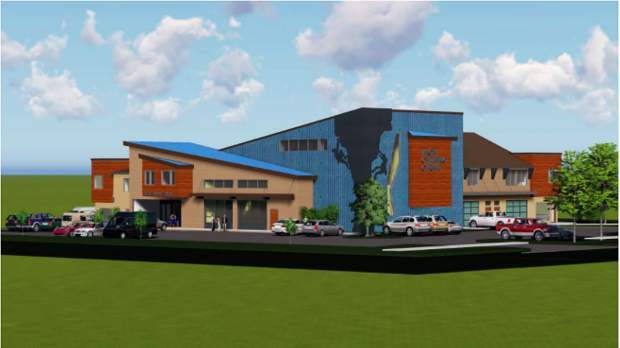 EAGLE — Two years after it was originally approved, a proposal for an indoor climbing gym in Eagle has been reinvigorated with the addition of commercial and residential construction at the site. This week, Dave Dantas, the owner of the property located at 700 Chambers Ave., presented a proposal to the Eagle Town Board to allow construction of seven live and work units at the site where the 15,000 square foot gym was approved in 2014. However, according to the Eagle staff memo concerning the project, the plan was not financially feasible and the revised project reduces the size of the climbing gym to approximately 9,000 square feet. The live and work units will be located on the western and southern sides of the building. Dantas has already built three live and work units on three lots located on the southern part of his Eagle Commercial Park property. These united feature commercial space at street level and residential space on the second story. “I think we are meeting a need there for housing,” Dantas said during the town’s Tuesday night hearing. Dantas said he first came up with the idea for a climbing gym at his property when his young son expressed an interest in climbing. He contacted Larry Moore, who runs the climbing program through the Vail Athletic Club. Moore said Dantas’ son was too young for his climbing team activities, but offered private instruction. “He (his son) was a little monkey,” Dantas said. This personal experience convinced Dantas there was a viable audience for a downvalley climbing gym, and he believed his property was a great location for the use. Moore agreed and has teamed with Dantas to plan the facility. “We had tried to get a big retailer the site, but they were scared about Eagle River Station going in and we were kind of in limbo for a while,” he said. After the town approved the climbing gym concept back in 2014, Dantas said he was able to raise some money for the proposal but ultimately he found the proposed size was simply too large. Additionally, a stand-alone facility didn’t work financially. For these reasons, Dantas said the project evolved to a 9,000 square foot gym and the seven live and work units. “I think there are enough people who are passionate about the sport that this place will take off,” Dantas said. In their review of the project, members of the town board found themselves asking some unfamiliar questions. In particular, they noted the 73 parking places proposed might be excessive. “We don’t usually hear from developer that they want more parking (than the town requires),” said Mayor Anne McKibbin. Moore noted that parking is a perpetual challenge for climbing gyms, particularly when they host competitions. “If we have a parking problem, it means we are successful,” said Dantas. The development group said they are looking at grass pavers and other options to lessen the visual impact of the proposed parking while still allowing all of the spaces. “I think it is nice to see a project with adequate parking, for once,” said town board member Matt Solomon. Additionally, town board members asked about the size reduction for the gym. “Are you confident that this is large enough — and I can’t believe I am asking that — to meet your needs?” said Town Board member Paul Witt. Moore noted that the gym space in the climbing building didn’t really shrink with the new proposal. Instead, associated uses such as office space were cut back. He noted with the addition of the live and work units, those uses can grow into other buildings at the site if needed. In a unanimous vote, members of the town board approved the live and work units and the smaller gym plan. They did place a condition on the project that the residential units in the live and work buildings cannot be sold separately from their attached commercial spaces. During Tuesday’s hearing several residents offered their support for the plan, both in person and in written comments. “I think this is another component for Eagle to attract young families to our community,” Moore said.